تنزيل قصة الصف الثالث الاعدادى الترم الاول , لغة انجليزية ،تحميل ,شرح,فيديو , مذكرات , اسئلة , قصة الجمال الاسود black beauty القصة المقررة على طلاب الصف الثالث الثانوى , تحميل قصة ثالة اعدادى ترم اول 2019,مراجعة قصة الجمال الاسود black beauty ,اسئلة على اسئلة قصة بلاك بويتى ثالثة اعدادى , فيديو وشرح قصة الجمال الاسود , الجمال الاسود black beauty . - مذكرات مجمعة لقصة بلاك بيوتى , الصف الثالث الاعدادى . تحميل شرح كامل و ملخص قصة الجمال الاسود ثالثة اعدادى . 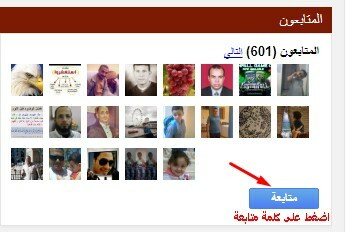 حمل قصة الجمال الاسود المقررة على الصف الثالث الاعدادى المنهج الجديد. شرح كامل,و ملخص , فيديو لقصة الجمال الاسود أو للفتنة السوداء اللغة الانجليزية, الصف الثالث الاعدادى, المرحلة الاعدادية, منهج الصف الثالث الاعدادى الجديد الترم الاول المنهج المقرر المطور ,شرح منهج ثالثة اعدادى , مراجعات انجليزى الصف الثالث ,قواعد ودروس الصف الثالث الاعددادى المنهج الجديد. تعرف على اسماء دروس ثالثة اعدادى انجليزى ترم اول وترم ثانى جديد . الحصان الأسود أو الجمال الأسود أو الفتنة السوداء هى رواية نشرت عام 1877 للكاتبة الانجليزي آنا سويل حيث ألفتها في السنوات الأخيرة من حياتها، حيث بقيت في منزلها بسبب الإعاقة, أصبحت الرواية أفضل الكتب مبيعا. توفيت سويل بعد خمسة أشهر من تاريخ نشرها, بيعت منها خمسين مليون نسخة، وتعتبر رواية الجمال الأسود احد أكثر الكتب مبيعا على مر العصور. ألفت آنا سويل هذه الرواية في وقت كانت فيه الخيل وسيلة التنقل المثلى والأكثر انتشارا، وقد لمست قلوب الملايين حيث بدأ أُناس عديدون يتعاطفون مع الحيوان الذي يتألم ويشقى بصمت دون أن يشعر به احد . 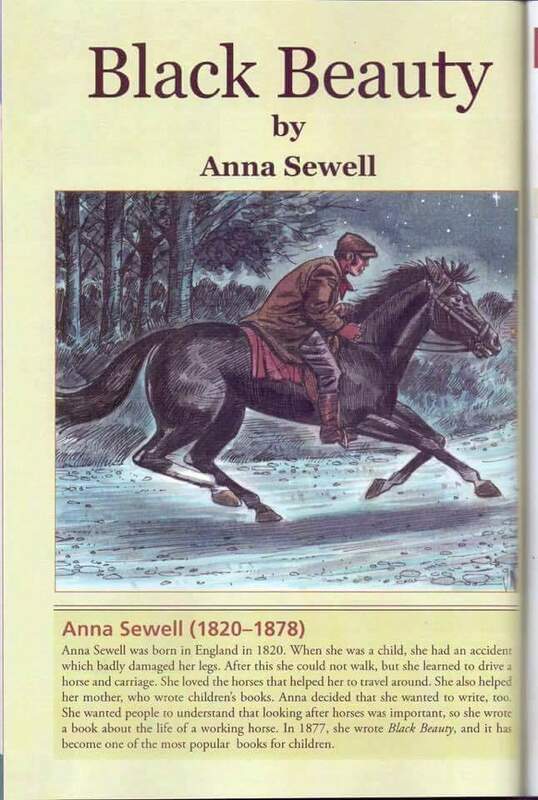 Anna Sewell was born in England in 1820. When she was a child, she had an accident which badly damaged her legs. After this she couldn’t walk, but she learned to drive a horse and a carriage. She loved the horses that helped her to travel around. She also helped her mother, who wrote children’s books. Anna decided that she wanted to write, too. She wanted people to understand that looking after horses was important, so she wrote a book about the life of a working horse. 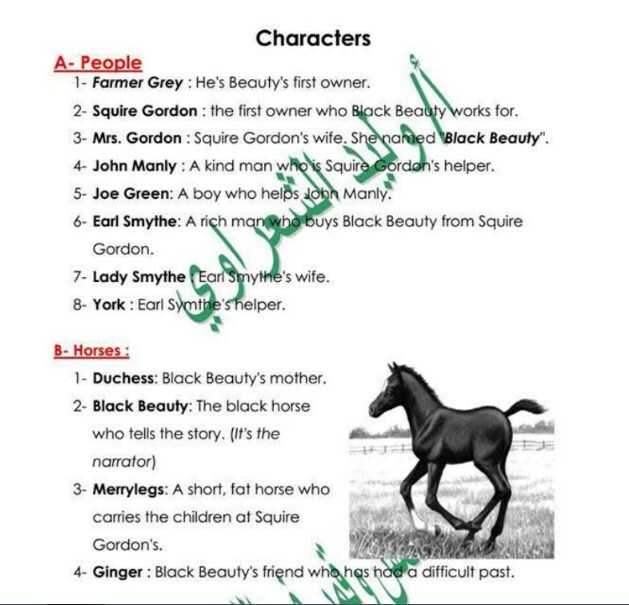 In 1877, she wrote Black Beauty, and it has become one of the most popular books for Children. - The black horse who tells the story. John Manly A kind man who is Squire Gordon’s helper. حمل قصة ثالثة اعدادى ترم اول المنهج الجديد العام الجديد 2018. The first place that I can remember is a large field with a little wood at the top, where I lived with my mother and some other horses. A small river ran along the bottom of the field. If I stood at the gate to the field, I could see my owner’s house next to the road. The owner, Farmer Grey, was a good man. He gave us healthy food and he spoke to us as kindly as he spoke to his children. There were other young horses in the field with me, but I was the youngest. I used to run with them, and have great fun. We used to have races, and when the biggest horses got too excited, they kicked and bit the horses next to them. One day, when my mother saw that was happening, she called me over to her. “ Listen to me. The horses in this field are all good horses, but they are not like us. I hope that you will grow up to be gentle and good, Never bite or kick, even when you are just playing a game.” I have never forgotten my mother’s advice. I grew into a tall, strong horse with a black coat, with one white foot and a white star on my head. I soon learned how to pull a carriage. Sometimes I pulled the carriage with my mother, and she helped me to learn what to do. “ my mother explained one day. “I hope you find a good owner. However, there are many kinds of men. Some are as good as our owner, but some are bad. We never know who might buy us. Sometimes people don’t understand what a horse needs.” I found out that my mother’s words were very true. When I was older, Farmer Grey decided to sell me to a new owner. His name was Squire Gordon and he lived in a big house in a place called Birtwick Park. It was a lovely place to live in, with large fields and comfortable stables. Squire Gordon had a kind helper called John Manly who looked after me, and I soon became friends with the other horses in the stables. One was a small, fat horse called Merrylegs. He was a jolly, gentle horse who was always making people laugh because of the way he walked. He carried the young children of the family. Another was Ginger, a tall horse with a sad face. Merrylegs told me that Ginger often bit or kicked because people were not nice to her in the past. Squire Gordon’s children used to bring me apples and nice things to eat,” said Merrylegs. “ But when they knew that Ginger bit people, they became frightened and now they don’t come to visit us horses any more. However, if people are kind to her she will soon learn to stop biting,” he explained. The next day, Squire Gordon took me out around Birtwick Park. “ How is your new horse?” asked his wife when we returned. “ He is a perfect horse!” he said. “ What shall we call him?” “ He is very handsome,” his wife said. 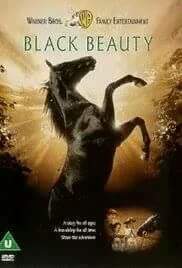 “ Why don’t we call him Black Beauty?” “ Yes, l like that.” said Squire Gordon. And that is how I got my name. On some days, I work with Ginger, pulling carriages. Although Merrylegs said that Ginger was sometimes bad-tempered, I found that she was thoughtful. She always worked hard so that I didn’t have to pull the carriage any more that she did. We soon became good friends. One day, when I was working with Ginger, she told me about the people she worked with in the past. None of them was kind and some of them were often cruel. She decided that she didn’t like people and didn’t want to do what they asked her to. The problem was that some people hit her hard when she refused to do what they wanted. That was when she started to kick and bite people. Then they wanted to sell her, and finally she arrived at Squire Gordon’s. However, as time passed, Ginger understood that John and Squire Gordon were different from her other owners. They were always kind and gentle with their horses and she was happy to do what they asked, most of the time. Then one day, she saw something that showed her that some people could be good. Squire Gordon was riding her when they passed a man who worked for Squire Gordon. The man was angry with his horse and hit it hard to make it go faster. Squire Gordon didn’t like this. “ I have never seen a man who was so unkind to a horse,” he cried. machine!” Ginger now began to respect Squire Gordon. After this, she decided she would not bite or kick people any more. “ She will be as good as Black Beauty soon,” said John. “ All she needed was for people to be kind to her.” One day, I was surprised when John brought Merrylegs back to the stable and said, “ Don’t do that again, Merrylegs, or you will be in trouble.” “ What did you do?” I asked him. I was very surprised because Merrylegs always behaved so well. “ Oh, I didn’t do much,” said Merrylegs. “ What?” I said, very surprised. “ But you are always so careful with the children!” “ Of course I am,” he said. “ I would never hurt the girls or the little children. But the older boys need a lesson sometimes ,” he continued. “ they think that a horse is like a machine, which can continue for hours without a rest. They never think that I can feel tired. So I stopped. When I didn’t continue, they hit me with a stick. Then I threw them off. They need to learn how a horse feels. “ Why didn’t you kick them?” said Ginger. نعرض لكم روابط تحميل القصة من حيث الشرح والاسئلة والمراجعات النهائية لقصة بلاك بيوتى لكى تحفظها على جهازك . الروابط هى عدة اعمال لخيرة معلمى اللغة الانجليزية للصف الثالث الاعدادى.